Best Before May 15th 2019. These award winning scrumptious bars are a clever combination of seriously healthy super fruits and friendly bacteria infused with the natural sweetness of raw dates and creamy smooth raw almond butter. SKU: BA110. Categories: 14 day forgotten, 3 day forgotten, 5 day forgotten, 5:2 forgotten, 7 day forgotten, During Your Juice Programme, General forgotten, SOS Bars. For Allergens see ingredients in bold In making this product we have taken steps to minimise cross-contamination with other nuts, sesame seeds, milk, soya and cereals containing gluten. May contain traces of date stone. Short shelf life – Best Before May 15th 2019. All of us at Juicy HQ are quietly pleased with ourselves, as we are delighted to introduce our revolutionary new concept – Juice in a Bar. These 55g bars are large enough to fill you for hours! Just Pure Yummy Superfood on the Go! 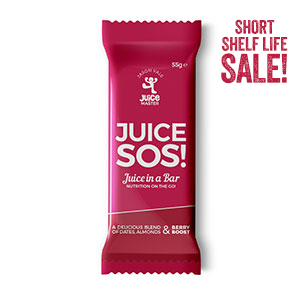 Juice SOS Bars are a revolutionary concept from Juice Master, combining the raw power of natural ingredients with a wide range of rich juices and vegetables. This really is a Juice on the Go! These bars contain a delicious blend of nature’s finest ingredients combined with a wide range of fruit juices that have been cleverly dried at low temperatures to preserve their nutritional value. Packed with vitamins, minerals, antioxidants, chlorophyll, phytonutrients & probiotics this is the perfect bar to consume if you are looking for a natural boost to your health bank account. Juice in a bar is 100% natural and contains no artificial anything, its simply pure yummy goodness on the go! Juice in a Bar is designed to be eaten as a superior healthy snack or as an alternative way to consume the raw goodness and nutrition obtained from juicing, in times when juicing is simply not possible. Raw dates, Raw Almond Butter, Strawberries, Blueberry Juice, Acai, Goji Berry, Pomegranate, Bilberry Juice, Black Cherry Juice, Graviola, Black Elderberry, Saw Palmetto Berry, Hawthorne Berry, Acerola Berry Juice. When food is in its raw natural state it is abundant in vitamins, phytonutrients and enzymes; enzymes are the key to life and without enzyme activity we are dead. When you ‘cook’ natural food, the enzymes are broken down and they are no longer able to function properly. You will never truly feel satisfied eating cooked and processed foods, as your body will still be craving ‘live’ food, abundant in enzymes, phyonutrients, vitamins and minerals. Almonds are high in Potassium, an important electrolyte that is essential for maintaining normal blood pressure and heart function. Almonds promote cardiovascular health by providing a high ratio of potassium vs sodium, thus making almonds especially good for protecting against high blood pressure and atherosclerosis (clogged arteries).